On the night of April 4th, the Moon was 10 days old and the sky was clear. It was also pretty cold. I hadn't been able to use my webcam for a couple of months so it took a bit of time to get up to speed. During previous attempts, I had made movie files at 5 frames per second but as I had upgraded my £10 laptop from USB1.1 to USB2, I tried recording at 10 fps. It wasn't a good idea, the camera still operated at USB1.1 speed so about a third of the frames were dropped without being saved and those that were saved had to be compressed so the images suffer a bit from compression artifacts. I didn't deliberately set out to make mosaics of the images but those that overlapped have been "mosaiced." I also tried a 2x Barlow on the webcam to see if I could manage to get a decent focus. The initial focusing was done using a 3 hole Hartman Mask over the front of my ETX90RA. The drive on the telescope was very jumpy so even more frames were lost because of that. Each movie file consisted of about 50 seconds of recording, the best 200 to 250 frames stacked using Registax. The same Wavelets process was applied to each image and final tweaking and aligning of the mosaic were done using Photoshop. Mare Imbrium, Sinus Iridium and Plato. 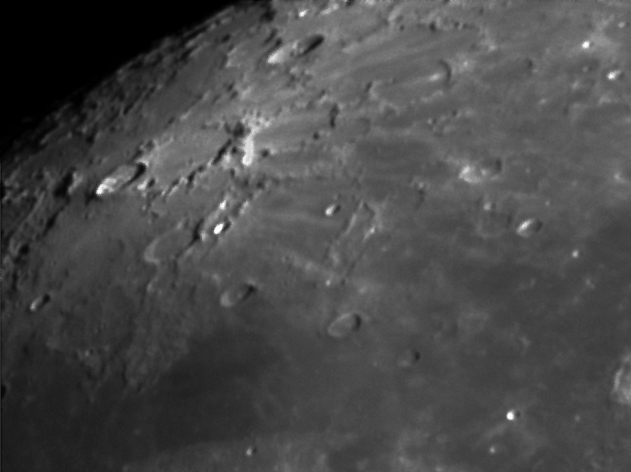 The crater in the centre of the image is Plato with the Lunar Alps to its right. The Alpine Valley is just visible. Below Plato lies Mare Imbrium with its large "bay area", Sinus Iridium, bounded on the north by the Montes Jura. The large crater on the terminator immediately above Sinus Iridium is J. Herschel. Further up the terminator are Anaximenes with Philolaus close by. Further north but slightly further from the terminator is the bright ray crater, Anaxagoras which breaks into the older, heavily degraded crater, Goldschmidt. Copernicus, Montes Carpatus and Kepler. The slumped walls of the crater Copernicus are very obvious in this image as are the rays and ejected material. Just to the north lie the Montes Carpatus with the craters T. Mayer and Mayer A at the western end. The fainter crater in the top right is Eratosthenes. 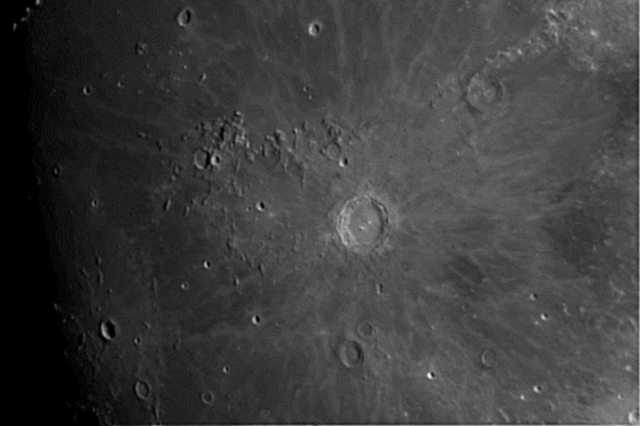 The crater below Copernicus is Reinhold with the conspicuous crater Kepler in the lower left corner. Kepler's rays are not obvious in this illumination but one ray stretching from Kepler to Reinhold is easy to pick out. 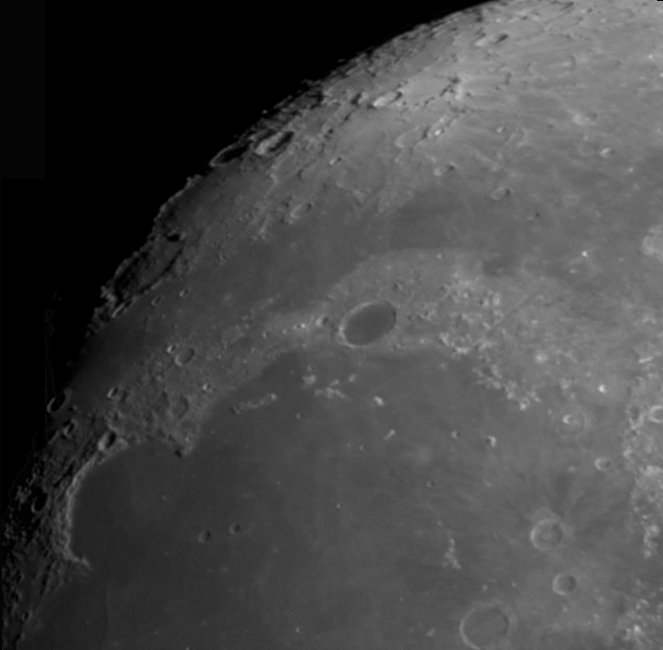 Tycho, Mare Humorum and Gassendi. 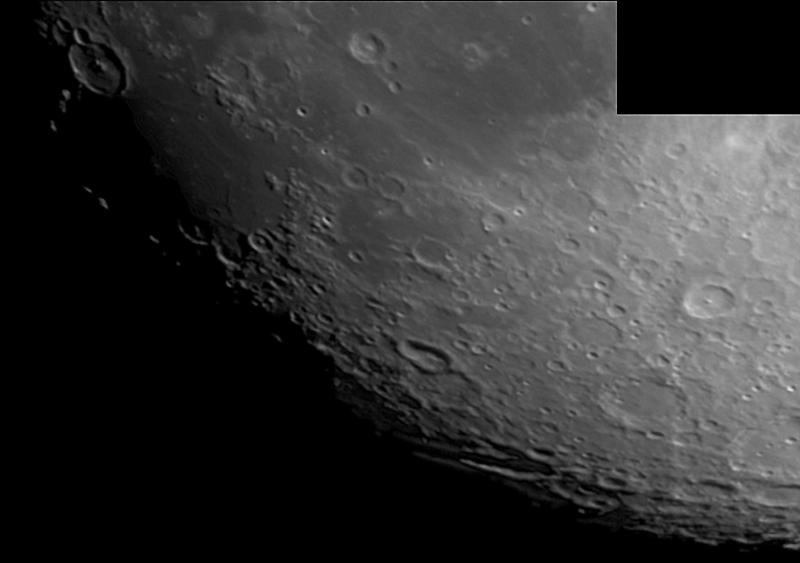 The prominent crater with two central peaks in the very top left of the image is Gassendi. Just to the south lies Mare Humorum with its wrinkled lava ridges. The very elongated crater near the termimator at the bottom of the image is Schiller, 180km long by 70km wide. The bright crater at the centre of the right hand side of the image is Tycho with its pronounced central peak. If you look closely, you can see Tycho's ray system. This image was taken with a 2x Barlow lens attached to the web cam. This means that the ETX90 was operating as a 2500mm lens at f/27.2!! The prominent crater in the top centre of the image is Scoresby. Towards the top of the image are Challis, Main and the slightly larger Byrd. The irregular crater Barrow is just below Scoresby with the slightly larger degraded crater Goldschmidt to its left. The fresher crater Anaxagorus which is responsible for the rays spreading across the image, has broken into the western wall of Goldschmidt.